Planning a wedding can be incredibly complicated, so why not make things easy for yourself and book one musician for the whole wedding? Job done! I'm Robert Douglas Kerr. Based in Edinburgh, I'm well placed to provide that traditional Scottish sound - on the clarsach (Scottish harp) for your wedding ceremony and any background music you may require, as an experienced organist and pianist for hymns and background music, and as the leader of Sounds Braw Ceilidh Band for the evening wedding reception. 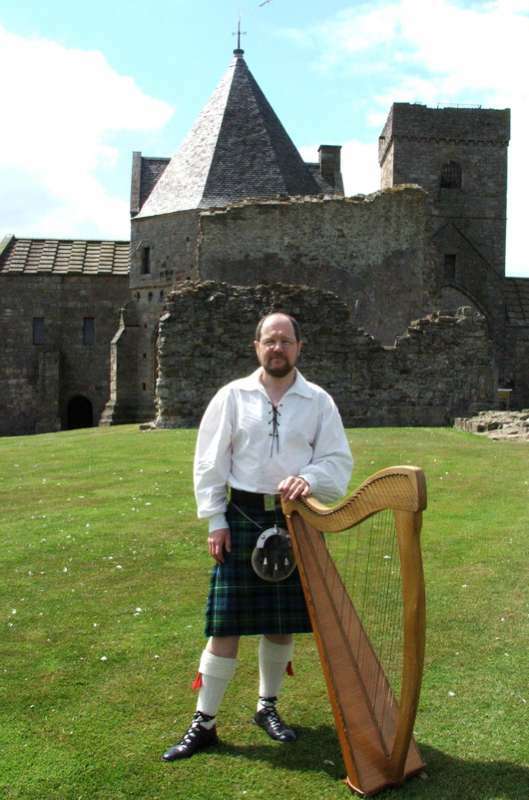 Play the Scottish Harp (Clarsach) while your guests are arriving for the wedding ceremony, for the bridal procession, for hymns in the case of a religious ceremony, during the signing of the register, for the exit of the wedding party, and while your guests leave after the wedding ceremony. Play the Organ or Piano as an alternative to the harp for any of the above during or after the wedding ceremony. Play the Scottish Harp or Piano (I'll supply a digital piano if required) as incidental background music at any other time - perhaps during the drinks reception or the wedding breakfast. Lead the experienced Sounds Braw ceilidh band for a ceilidh at the evening wedding reception. Garvock House Hotel, Dunfermline; Keavil House Hotel, Crossford; Fernie Castle Hotel, Letham; Aberdour Castle; Woodside Hotel, Aberdour; Murrayshall Country House Hotel, Scone; Dalhousie Castle, Bonnyrigg; Atholl Palace Hotel, Pitlochry; Royal Scots Club, Edinburgh; Balmoral Hotel, Edinburgh; Swallow Hotel, Dundee; Invercarse Hotel, Dundee; Murrayfield Stadium, Edinburgh; Dean Park Hotel, Kirkcaldy; Linlithgow Palace; Houston House Hotel, Uphall; Moat House Hotel, Glasgow; The Corinthian, Glasgow; The Mill Hotel, New Lanark; St Margaret's Chapel, Edinburgh Castle; The Carlton Hotel, Edinburgh; Radisson SAS Hotel, Edinburgh; Balgonie Castle, Glenrothes; Stirling Castle; The George Hotel, Perth; Rusack's Hotel, St Andrews; Dundas Castle, Dalmeny; Lennoxlove Castle, Haddington; Barony Castle Hotel, Eddleston; Carfraemill Hotel; Lauderdale Hotel, Lauder; Philipburn House Hotel, Selkirk; Auchrannie House Hotel, Isle of Arran. If your wedding venue is in or close to Edinburgh, Glasgow, Stirling, Perth, Dunfermline, Linlithgow, Bathgate, Kirkcaldy, Glenrothes, Dundee or St. Andrews please contact me by email or better still by phone on 07932 162169 to check your dates and discuss what you'd like. There's no obligation to book - please get in touch for a chat.